I hope everyone has had a happy holiday. 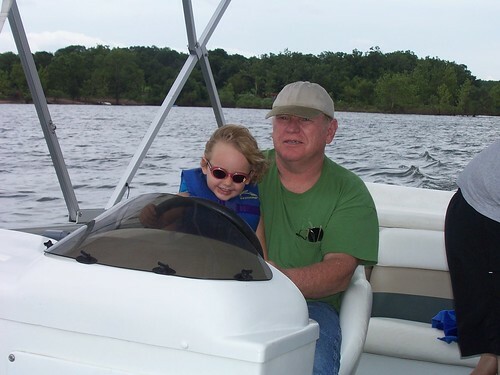 We left early for Missouri because my dad is in the hospital. He is still there but doing much better now. We had to celebrate Christmas without him or my mom. We took stockings to the hospital for him to watch the kids open but he was really too out of it. 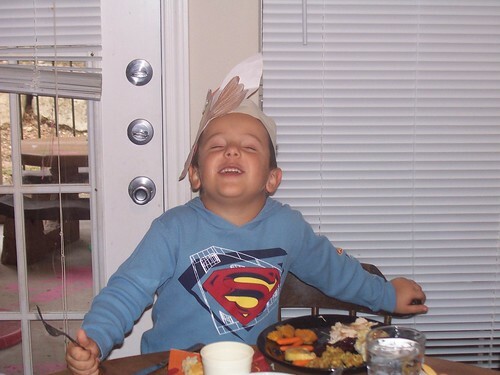 Therefore I don't really have any great Christmas pictures to share. 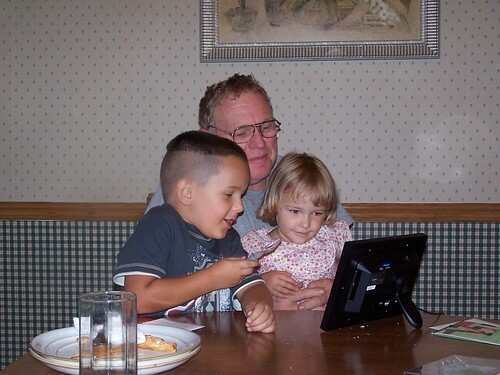 Instead I'm going to share a couple of my favorite pictures of Simon and Lizzy with my dad from last summer when they were able to visit with him. My apartment is full of bags and presents from the trip home yesterday and a good mixture of moving boxes. 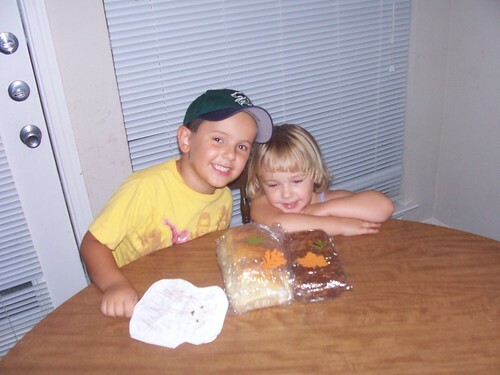 Hopefully I'll be in the scrapbook room tomorrow as I still have presents to make for family we are seeing on January 3. I am knee deep in Christmas cards and gifts today. I went to the dentist this morning and found out I will be having a root canal tomorrow instead of finishing up gifts for next week. Merry Christmas to me. I just finished the Christmas card for my brother. He collects frogs. When I say he collects frogs I mean we have decided he should collect frogs and have proceeded to supply him with frogs whenever we can. 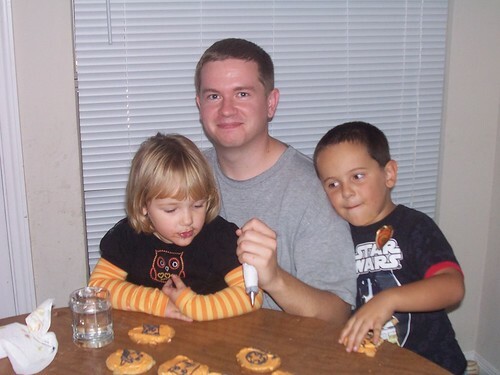 Last year it was frog ornaments and those annoying dancing and singing figurines (my kids love those!). 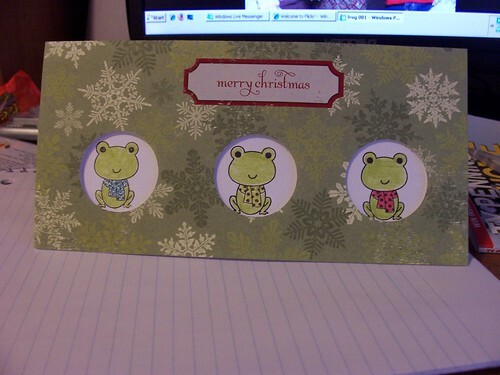 This year I haven't found a certain something just froggy enough so I settled for a frog card. The Twilight Inspiration challenge for this week was to create a Very Cullen Christmas. This is the first time I have had the time to participate in one of the challenges. Some of you may not know about my Twilight obsession. I am not a big fan of the movie but the books were specatular. Anyway, on to the card. 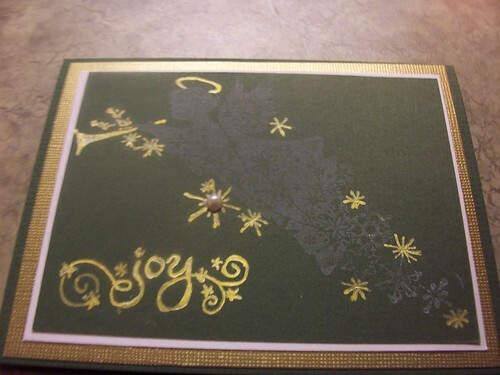 The card base is a shimmery green cardstock with glitter paper embossed with the snowflake folder. 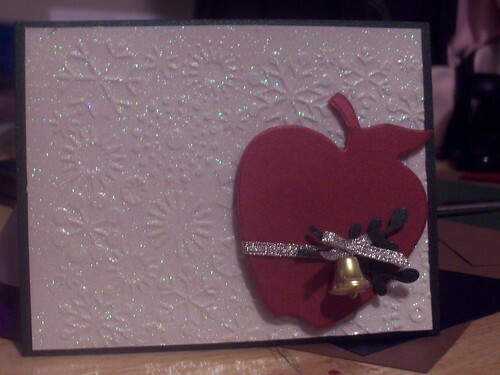 The apple was cut with an accucut die in red shimmery paper. The mistle toe is from the Vixen set by Quickutz. I didn't stamp a sentiment because I couldn't think of a good one. The card sparkles all over like the Cullens and the apple speaks for itself. The last week of my semester is this week. I am also trying to cram 30 hours of field experience into the next two weeks as one of the administrators at the school failed to get me placed earlier in the semester. As a result of the end of semester projects and field experience, my craft area feels neglected. I have a just rite monogram stamper that I have wanted for a long time that hasn't seen ink yet because school is calling. A couple weeks ago I did attend a crop and managed to finish a few more Christmas cards so I will share those today so my blog isn't as lonely as my craft room is. This first card is very simple but I think it turned out rather elegant looking. The main image is from an inkadinkado stamp set. I used gold ink, gold paper, white paper and a sheer ribbon. This card uses another image from the inkadinkao stamp set. I stamped it in white stazon and then traced the horn, halo and stars with a gold gel pen. The papers are gold and green. 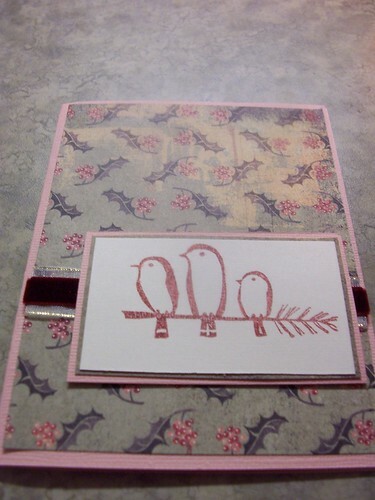 The bird card features paper from Basic Grey Wassail and a trio of birds from Inkadinkado. 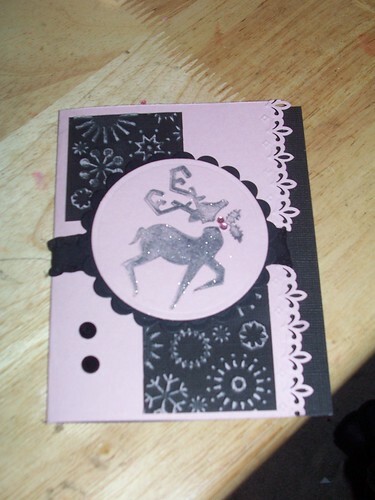 The card is finished with velvet and sheer ribbon. 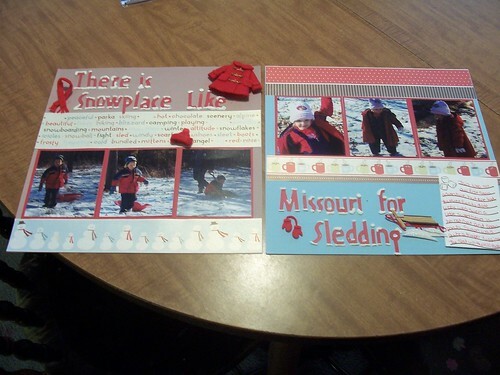 The last two cards both feature the snowflake Santa stamp. 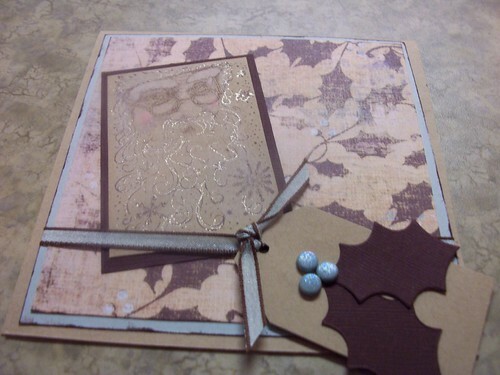 The pink card is finished with more Basic Grey Wassail paper and the blue Santa card features My minds eye paper. The last week has been a whirlwind. I celebrated my birthday on Friday by going out to dinner with friends and watching the Twilight movie. I went to a crop on Saturday and the rest of the week has been spent getting ready for Thanksgiving. This year I am thankful that my family is all in good health, my husband is still employed when so many we know are out of work, the fall semester is almost over and I'll soon be able to devote some time in the evening to my family and my scrapbook room, and I passed my certification exam so I will be able to student teach this spring. Simon came home with a turkey hat. 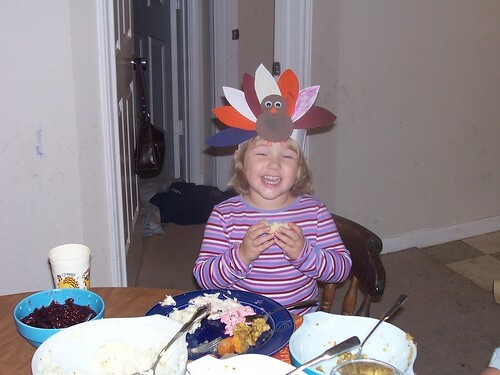 Lizzy could not be out done so she made a hat today. The weather has turned cool here in Central Texas. I miss the changing of the seasons the most so when we actually drop below 70 I get excited. It's rare to be this cool so early in the season here but I'm not looking a gift horse in the mouth. The weatherman is calling for a hard freeze tonight. I can't wait! In honor of the cool weather I used some of the new stamps I received today for my birthday from my parents, to create a few Christmas cards. I pulled out my new box of Gingerbread Tea and put on some flannel pajama pants and then put ink to rubber or acrylic in this case. 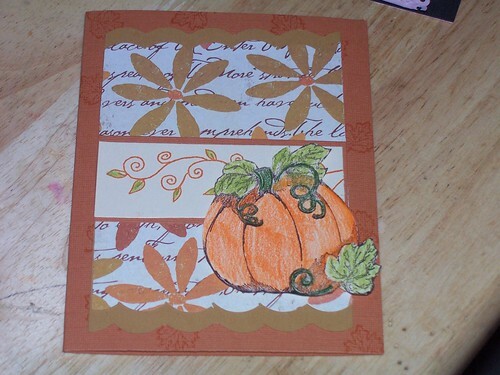 This card was created for the Wednesday Sketch Challenge202 on Splitcoaststampers. I created this card for the sketch challenge on 2 Sketches 4 You blog. The last card I made tonight was just for fun because I love these little birds. 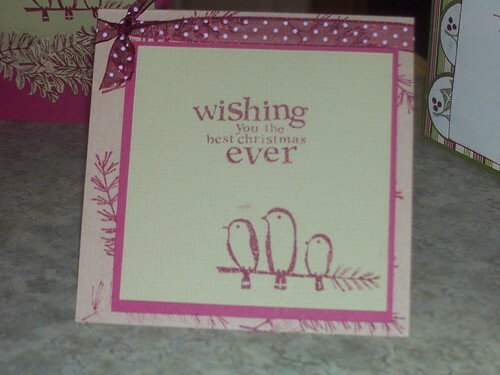 I have always wanted the peaceful wishes stamp set by Stampin' Up. This set by inkadinkado has the pine branches I love from the peaseful wishes so I think I'm set now. I am a confessed ribbon junkie. I can not pass up a ribbon rack, a ribbon sale or the $1 bin ribbons. I buy lots on spools and even more by the yard. About a year ago ribbon storage became a delima for me. I didn't have a good storage system. 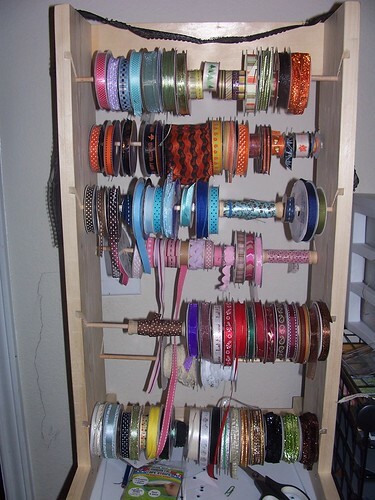 I hated the ribbon cards, I didn't want to take the ribbon on spools off and I wanted to be able to easily see all the ribbons I have at one time. The solution to my storage problem came in two forms. 1. A handy dad and some wood scraps. 2. 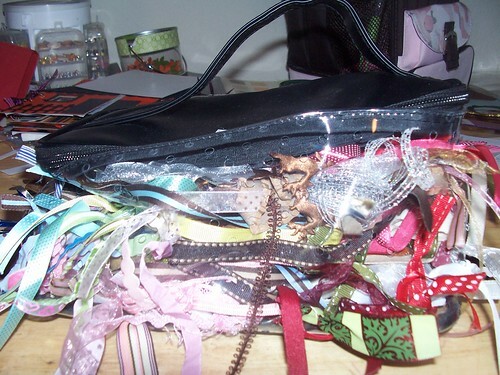 The ribbon bag at Felicia's Scrapbooks. Here is the ribbon tower my dad fabricated for my mom and myself. I've thought of painting it, maybe decorating it a bit but then I'd be without easy ribbon access so that hasn't happened. Here is a phot of the ribbon bag. I love this bag, it holds like 200 yards of ribbon. It's easy to see what you have and it's very portable. I am closing the book on Halloween. I posted my haunted house book earlier. 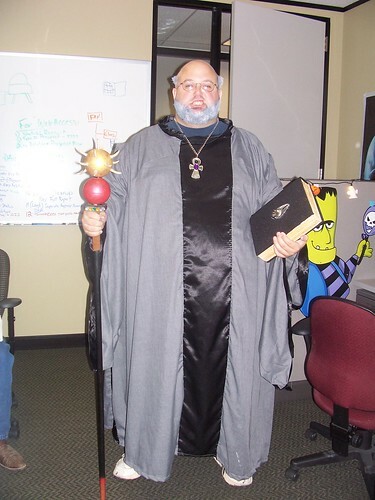 Now I am going to share my husband's costume. I actually sewed it. I am a little nervous about sharing it as 1. I am NOT much of a seamstress. 2. The largest pattern I could find was a XL and my husband needed about a 4XL so I had to enlarge the pattern and had no concept of how to enlarge the pattern. 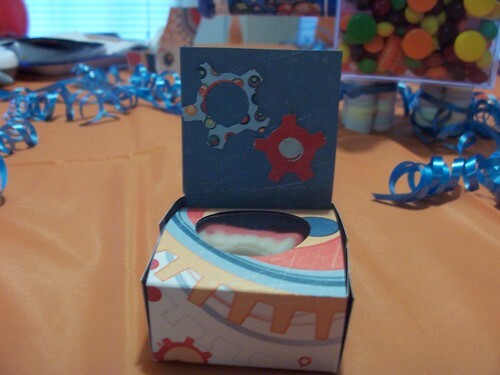 Fletcher created the book (it opens to reveal candy) and the staff himself. 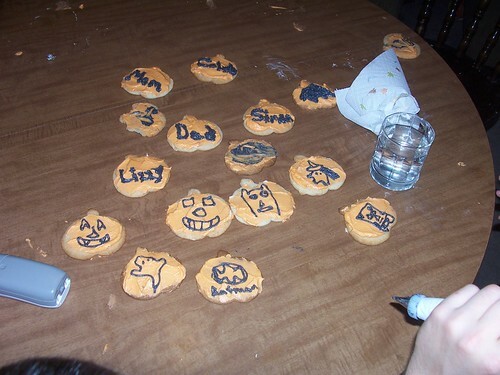 I have also included some pictures of the kids decorating Halloween cookies. It's a family tradition of ours. Since my brother was here visiting, I let him have the decorating honors. I baked, made frosting and took pictures. 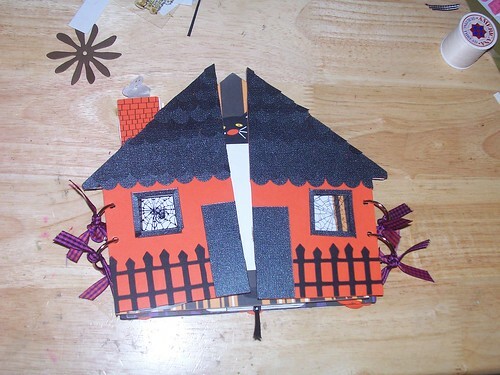 I created a Haunted House book for a class at Felicia's Scrapbooks in September. The book had several interactive pieces to it. We ended up only running the class once due to time constraints. I finally brought my sample home to fill with pictures. Since it will probably take several weeks (meaning sometime after the New Year) to get pictures printed and put in the book (I know, I know my kids are always jpegs) I am going to share the blank book with you. I can't begin to remember where all the supplies came from. I know there is some Bazzil Bling and Karen Foster papers but beyond that I'm not certain. This first picture is the cover. The cover is split down the side and opens both directions. The windows have acetate with spider webs stamped on it (stamp set is by inkadinkado). The roof is scalloped strips cut in Bazzil Bling. The two cover pieces open to reveal the first page. The cat's tail moves back and forth. The cat is cut from a sizzix die. The cat mummy is a stamp by Inkadinkado. 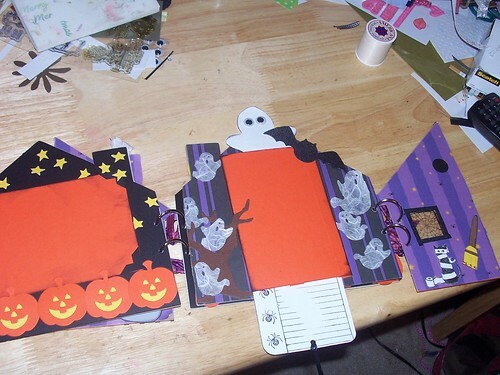 The next page has a tab that pulls down a journaling block and pushes up a ghost. 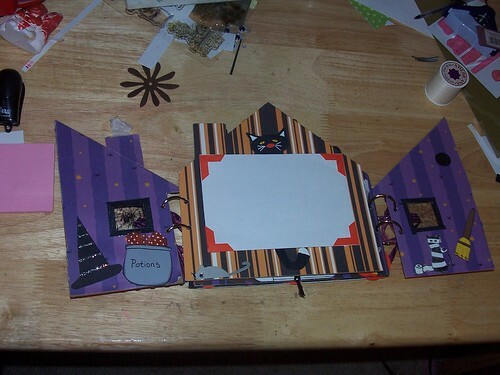 The last page has a paper pieced pumpkin that pulls down for a photo and a journaling block. I always promise myself I am going to do at least one or two sketch challenges every week. There are so many great sketches out there and they really help to stretch creativity a bit. This is the first weekend that I have had any spare time to do a little playing in the stamp room. I've been busy with family and class commitments the last few weeks. 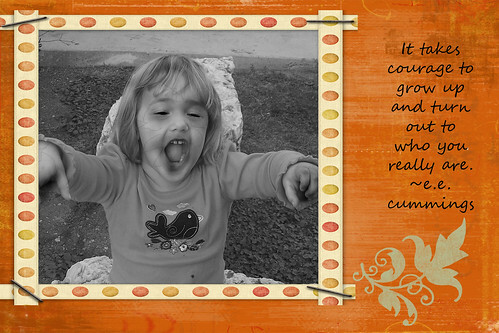 The first sketch challenge I participated in is Taylored Expressions Cupcake Challenge (TECC40). 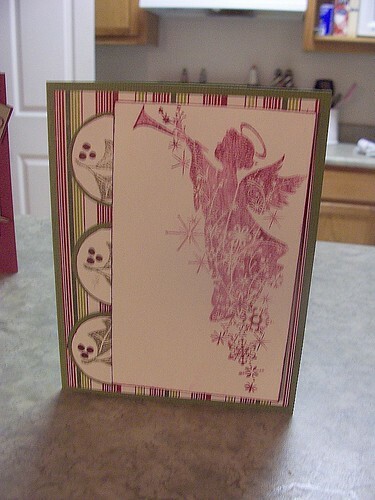 For this card I utilized some scraps I had laying around from other Christmas cards. I also used (gasp) some Studio G $1 stamps. I always buy those little buggers and then never use them! 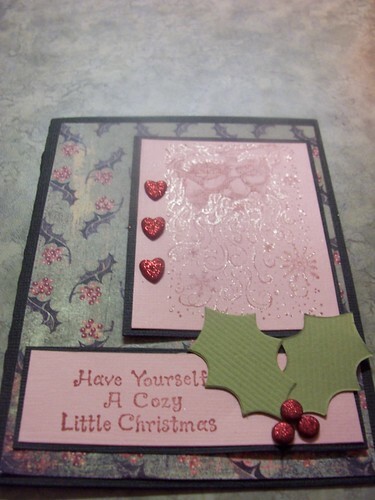 I added some candy cane stickles and gem stones to finish the card off. The next sketch challenge I created for is Beate's Weekend Sketch Challenge #64. 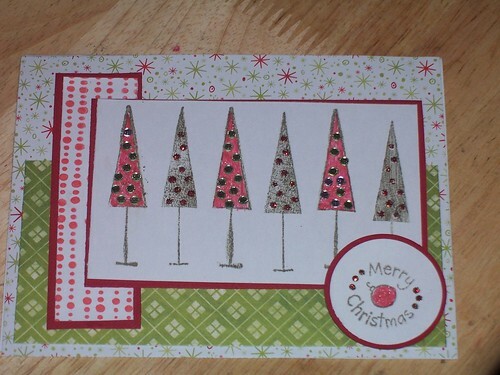 For this card I used some new rubber I received from a secret sister swap on Stamp Shack. It was a sheet from I brake for Stamps. 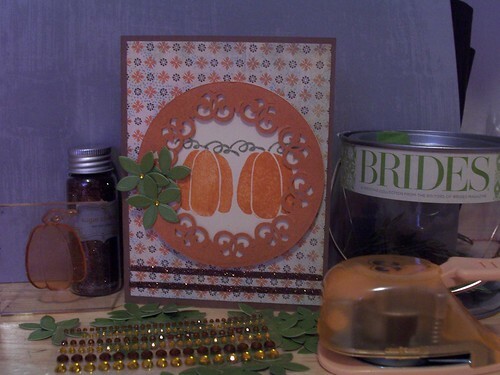 I used pumpkin paper and ink with some scenic route scraps. The last sketch card I was able to finish is for Mytimess10. I tried to go really non-traditional Christmas. I'm not sure if I like it yet or not. The paper is co-ordinations. One side is black and the other pink with a pink core. 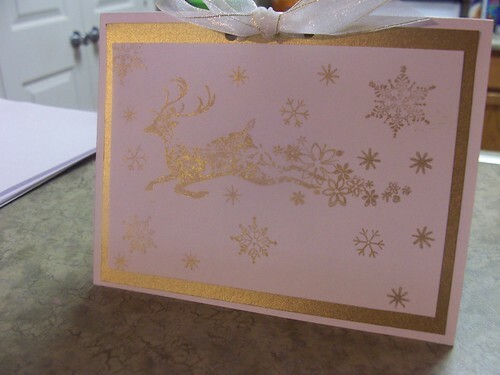 I embossed with the snowflake embossing folder and then sanded it to bring the pink out. I added the reindeer (a $1 purchase from last year, I'm on a roll using those!) and accented him with a stardust pen and two gems. I also used a fiskar's boarder punch, some ribbon and a couple more gems. I found some interesting things out on the blogs I check out. 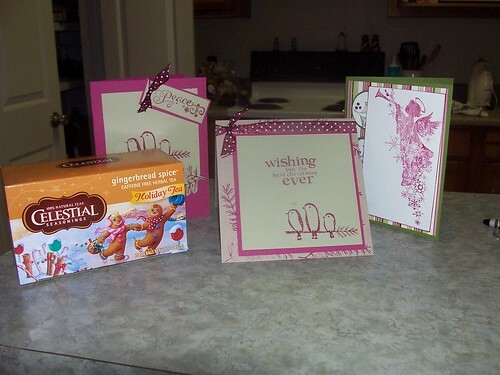 Don't forget about Gina K cards for the troops. The deadline was extended to November 5. I have more cards ready to go. Ali Edwards has a daily journal for December on her blog, it's a neat format and I'm considering creating one this year as so much happens during the holidays that I would like to have a little journal to record the highlights in. I also found this cute little box on Mel Stampz. It is screaming teacher/bus driver/principal gift to me. 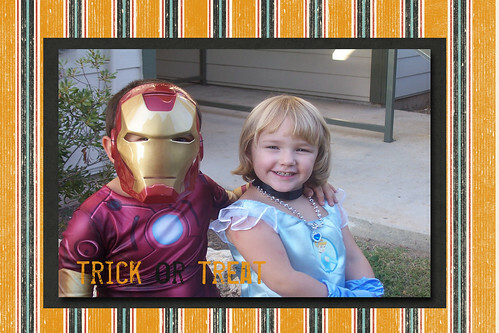 Last but not least, Felicia at Felicia's Scrapbooks has started a blog for the store. If you found any other goodies to share, please post a comment! I love the new winter birds stamp set by Inkadinkado. 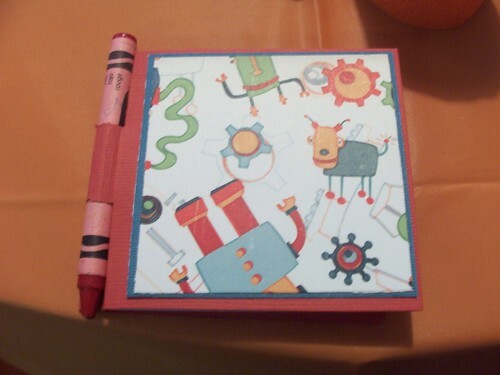 I encouraged Felicia's Scrapbooks to begin carrying the Inkadinkado stamps. I could not resist when this set showed up in the store! It is such a great value--$9.99 for so many big images. After getting the set, I realized it would take a little more thought to use these stamps as they are for the most part solid images. This owl is my favorite stamp of the set. I haven't seen anything else quite like it. For this card I embossed the white panel with the snowflake embossing folder (one of the best folders) and cut a white circle and a black circle with the spell binders. 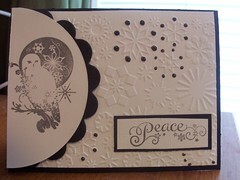 I stamped the owl on the right side of the white circle and then layered the white onto the black scalloped circle. 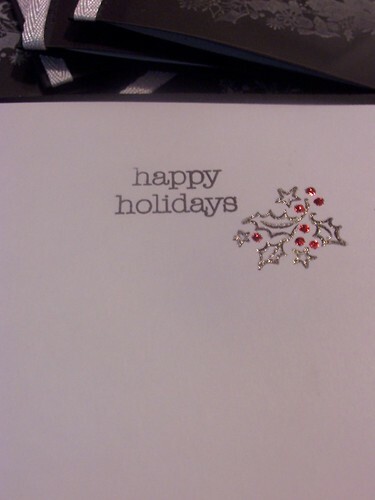 I cut the circle down (a little less than half) and pop dotted it on the card. 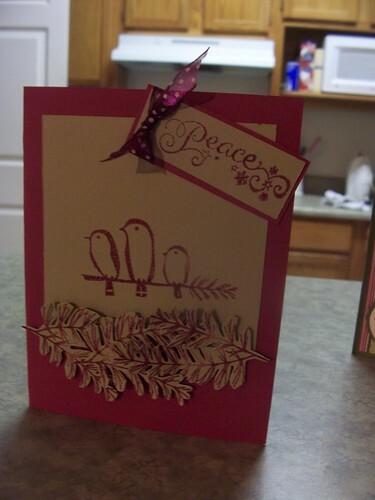 I stamped and trimmed the peace sentiment then layered it on the card. Lastly I used the stickles on some of the snowflake "dots". I have to confess I am a paper junky. 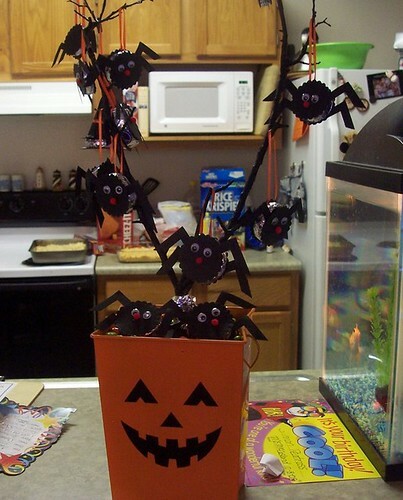 I love to make things from paper, cut, glue, embellish--I'm all about the real projects. 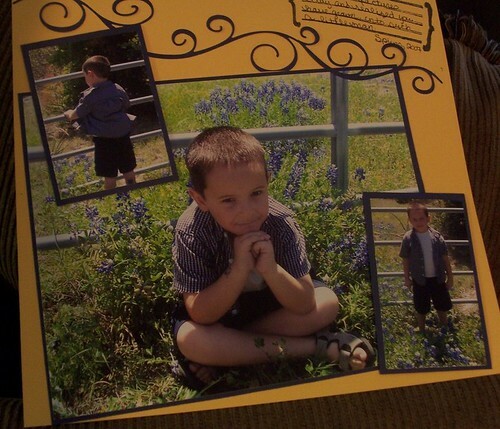 I have never been a fan of digital scrapbooking. I do however enjoy manipulating photos. 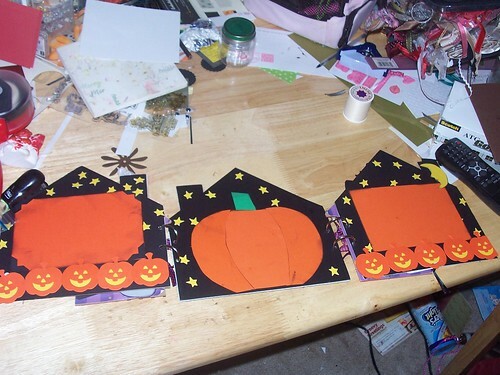 I have been making Halloween cards to send to family and friends. 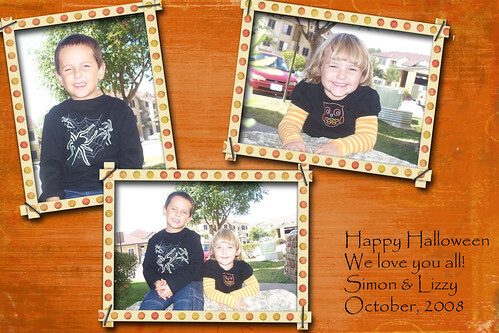 I wanted to include a couple of pictures of the kids. Snapfish has a one penny print sale going on right now so I thought maybe I would splurge and send everyone two pictures this year. My dilema was I took several pictures of the kids that I really like. I had to chose between A. Narrowing my selections down to 2 pictures, B. 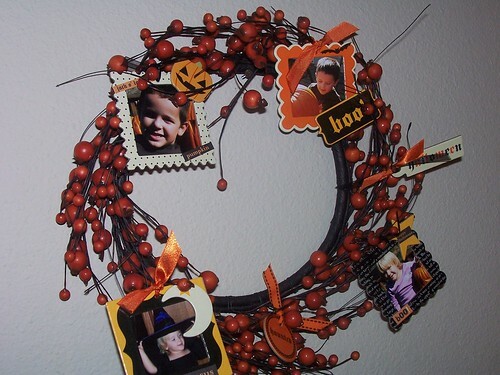 Sending different pictures to different family members, or C. Use photoshop elements to create my own little scrapbook page to send. I took the plunge and went with option C. I am not sold on digital scrapbooking, however I can now see some advantages (calendars, Christmas gift books) that I will be taking advantage of in the future. I am still loyal to my paper. In fact I'm going to go spend a little time with my neglected paper and create another goodie. The party is a success! 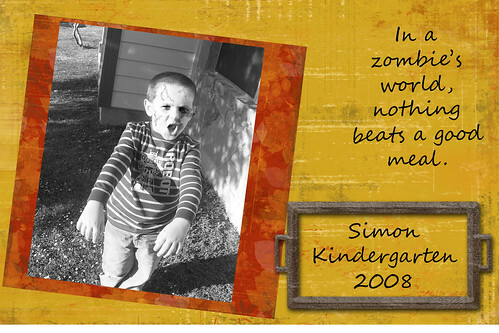 Simon had a blast and all little people are now sleeping off their sugar coma. Scroll down to see the handmade items. This is post #2 for today. As usual Simon received way too many presents but is very appreciative. 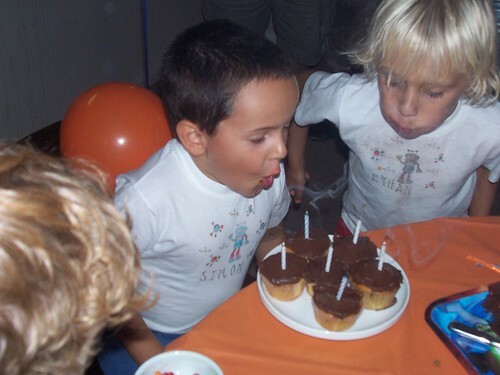 I've shared two of the best birthday pictures. I've been super busy the last few days. 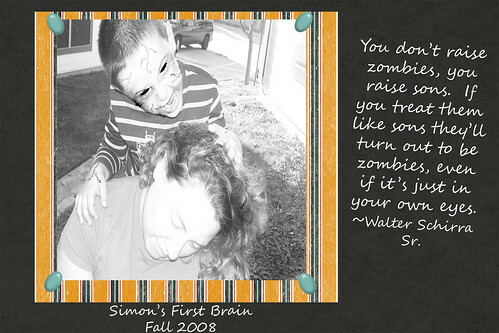 Mostly with school but all my craft time has been consumed with getting ready for Simon's birthday party. 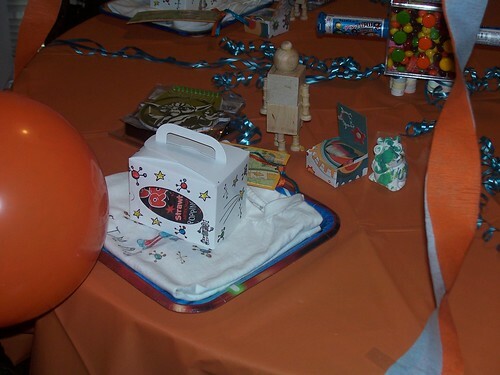 The party is today and I made most of the favors for the kids. 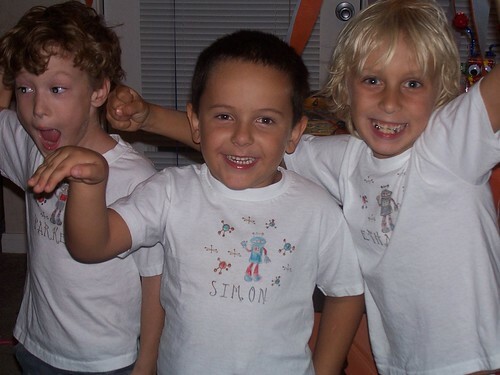 He wanted a sleepover so we just had a couple of close friends who have stayed with us before. For the party I made personalized t-shirts; the idea came from Lauren's blog where she posted about stamping and using crayons to color the images on fabric. 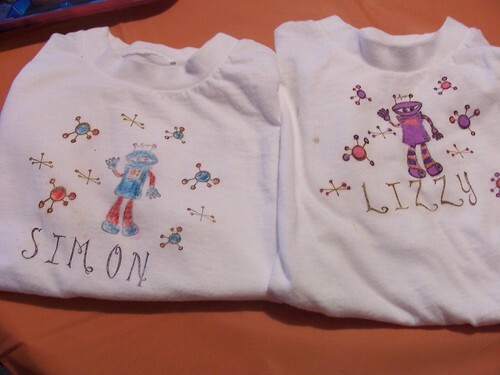 I colored the t-shirts for the kids because it was rather difficult to color on the t-shirt part. 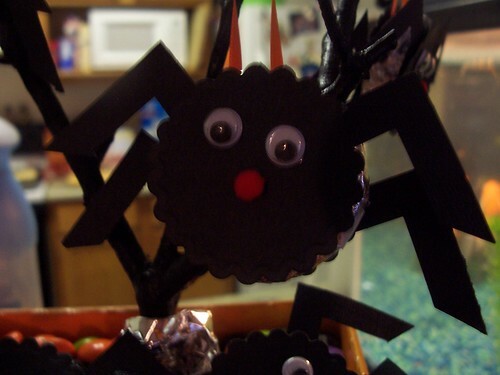 I also made several little goodies--a post-it holder, a peek-a-boo box, a book mark and I decorated a box that held some other little treats like pop rocks. 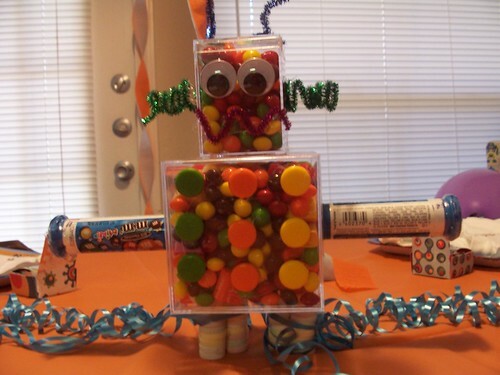 My last handmade item was the candy robot center piece. I think of everything he is my favorite. 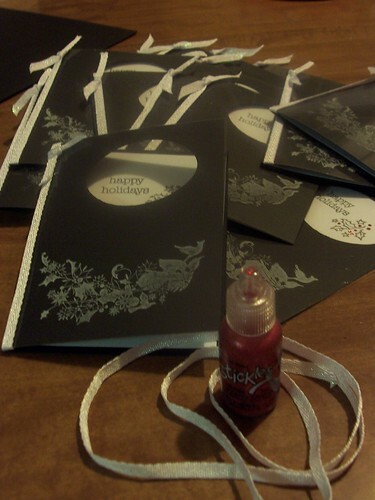 All the stamping was done with an Inque Boutique stamp set.